The Chief Secretary to Government, Amb. Isaac Lupari CBE has urged the Heads of Departments and Government Agencies to take lead in changing our attitude to work at the 7th Departmental Heads meeting today at the Institute of Public Administration. Amb. Lupari said one of the biggest obstacles to progress and development of our country is our attitude. “This don’t care attitude has become a norm in the public service today. “It has become the greatest liability to our progress,” Amb Lupari said. “Many of us don’t see it. We take things for granted, simply because we get paid every fortnight irrespective of our level of attendance and productivity. “We come to work late. We don’t attend to our work in a serious manner. We don’t act decisively. We have an ‘I don’t care’ attitude’. We leave things to the last minute. We don’t work together and the list goes on. “Don’t we think this is totally unfair and morally wrong? How can we do this to our people and our children? “When these people depend on us to give them an opportunity to make or improve their lives. Amb. 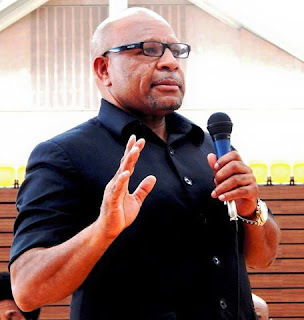 Lupari said the Public Servants take things for granted, thinking the role of serving the people of Papua New Guinea is someone else’s responsibility and they are not aware of the enormity of these responsibilities. “So who is going to help our people? If you are thinking someone else, then you are wrong and you are in the wrong place,” the Chief Secretary said. “It is us, we the Public Servants. “It is time in this age, we take our jobs seriously. We must take the lead and we must lead by example. “What we do with our responsibilities and how we deliver on these responsibilities, directly affects lives of our people and our children. “Today, Public Servants consume almost K4.0 billion of the total budget on an annual basis just on wages and salaries alone. This accounts for 30% of the budget. If we add the operational costs, we are talking about almost 70% of the total budget outlay. “This is a massive financial resource going into our wages and salaries every year. Our people are paying us to do a job to serve them. Amb. Lupari said it is not fair to our people and Public Servants have to be honest with themselves. He said looking at the Public Service pay roll history, on average, pay for Public Servants has increased by 55% and the average pay of the lowest paid has increased by 75% since 2010. “Lowest paid Public Servants were earning K350 per fortnight and today they are earning K600 per fortnight,” he said. “For example, entry salaries for Based Grade Police Constables has increased from K600 to K1, 050 per fortnight, and likewise entry salaries for Based Grade Teachers from K390 to K900 per fortnight and entry salaries for Base Grade Nurses from K450 to K820 per fortnight. “We are well paid by our people. Every Public Servant is earning a decent wage. “We should be the ‘last people’ complaining about being paid lower wages. Every Public Servant is earning a decent wage – sufficient to sustain a decent living. “I think the Government through the Public Service Ministry should publicize our Payroll policy so that every citizen can see who is earning what. “I can tell you when the public see what we are getting every fortnight; we will not get any sympathy from them. Amb. Lupari said the future will be created by us and we owe it to them so it is time Public Servants must wake up and take their jobs seriously. He said that means Public Servants must change their attitude to work. They have to leave those old habits and practises behind. They must rebuild the culture of discipline, commitment, loyalty, dedication and sense of belief in themselves. “Let me say this, the future of our country, our people and our children depend on us. Make no mistake, we are responsible and we ought to be held accountable,” Amb. Lupari said. “I encourage all of us, every Public Servants in all levels of Government – Local, District, Province and National to wake up - and take our jobs seriously. Amb. Lupari said if Public Servants do not take their jobs seriously, the future of the people and children of Papua New Guinea will be in jeopardy.